Infiniti’s bid in the compact luxury SUV segment – a niche market if there ever was one – comes in the form of the 2008 Infiniti EX35. The EX predictably inherits several technology and design cues from its big brother sports crossover, the Infiniti FX, but don’t go thinking the cheaper EX is a budget compromise for FX buyers sitting atop the fence. More than anything else, Infiniti’s compact ‘ute feels like a bargain, with its upbeat-for-an-SUV dynamics and well-appointed interior. A host of next-generation technology features add additional appeal to the EX, and drivers can spec such enticing options as a 360-degree Around View Monitor and satellite navigation with real-time traffic updates. If innovative design and high-tech gadgetry are your top qualifications in a new car, then Infiniti has put together quite the package for you because, in fact, the EX feels more like a G Sedan with a taller roofline than anything else. Sedan-like driving characteristics make the EX35 nimble and wieldy both on the highway and in the city – after all, it is based on the G Sedan. The seats are incredibly comfortable and well supported, making the car ideal for long trips. The design is pretty much like nothing else on the market, in a good way of course. Rear seat passengers don’t have a whole lot of legroom to work with but if they do manage to squeeze into the back, there won’t be too much space in the rear cargo area for whatever they’ve brought along. It gets pretty spendy with all the options. If it weren’t for the raised seating position of the EX, you’d swear you were driving an Infiniti G35 Sedan. The EX35’s steering is slightly softer than that of the G, but aside from that the EX feels every bit as nimble and engaging as its lower, four-door stablemate. The Nissan/Infinity V-6 powerplant provides the EX with ample power, and revving it above 6,000 rpm reveals very non-SUV acceleration, which makes for a more appealing drive, though with gas prices on the rise you’re likely to feel some pain from repeated high-rev sprints. The overall ride is very compliant and smooth, even on broken city surfaces, and road noise from both the tires and air resistance is practically non-existent at freeway speeds. The EX35 is powered by Infiniti’s familiar, award-winning VQ 3.5-liter V-6, in this guise making 297 horsepower and 253 lb-ft of torque. Both rear-wheel drive and all-wheel drive models are available and are driven through a 5-speed automatic transmission, which rev-matches downshifts for smoother gear changes. Nissan offers a highly recommended navigation package that provides drivers with a split-screen view that is able to present both 2D and 3D views simultaneously, as well XM NavTraffic which displays real-time traffic updates and estimated travel time when a route is entered. Infinity’s Intelligent All-Wheel Drive system is included with the EX35 AWD Journey, and shifts torque to the rear wheels for better dynamic performance in the dry, but splits torque as needed between all four wheels when traction is limited. Infiniti’s Around View Monitor turns parking into a videogame; giving you not only a backup camera view but also using four cameras placed around the car to give you top-down, god-like view of the entire situation around the car. Like Neo says in The Matrix, “Whoa!â€ It’s an incredibly impressive system, and makes precise maneuvers astonishingly simple. The new Lane Departure Prevention system monitors the car’s position within the lane and sounds off with an audible warning if the EX drifts too close to the lane divider, and even applies brakes as necessary to keep the car in the lane. It can get a tad bit overbearing at times, but can be deactivated with the push of a button. While it’s surprisingly quick and powerful, the EX35 is no binge-drinker. The rear-wheel drive model makes its way through a gallon of gas every 17 miles in the city and 24 on the highway, while the EX35 AWD returns slightly less thanks to its bulkier drivetrain, netting 16 mpg in the city and 23 mpg in the highway. Both models achieve an LEV-II emissions rating. The EX presents an attractive, leather-shod interior, highlighted by what Infiniti claims are Kimono-inspired seats; we don’t completely see the connection, but rest assured they’re fantastically comfortable. The rest of the cabin is luxurious, especially at this price point, with a well-designed center console that’s unmistakably Infiniti. From the outside, the EX comes across as an attractive yet unconventional form. The long, low hood line flows rearward into the passenger cabin, with a roofline that slopes dramatically as it moves towards the rear of the vehicle. Twin tailpipes hint at the powerful V-6 lurking under the hood. 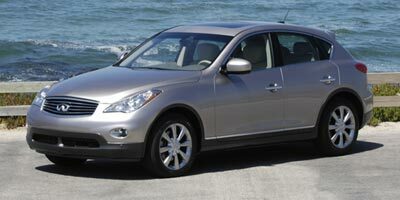 Prices for the Infiniti EX35 start at $35,450 for the rear-driver and $36,850 for the all-wheel drive model. After cramming in a few highly recommended technological options, buyers can be expecting to pay a final price in the low-to-mid $40k range, with the Infiniti’s chief rivals coming in the form of the Lexus RX 350, Cadillac SRX, BMW X3 and arguably, Volvo’s XC70 wagon. Describing the EX35 as a G35 Sedan on stilts wouldn’t be too far off the mark; not that we’re saying that’s a bad thing. It’s a comfortable, well-appointed compact SUV that offers more versatility than a sedan while suffering a minimum impact on fuel economy. 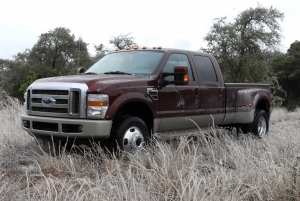 While it might not be as sporty or large as the FX model line vehicles, it’s certainly a difficult bargain to argue against.